" A great fit. A better advancement from the last model for a better seal around your nose. " " Have had no issues with the Eson 2 Nasal Mask, my second one. " 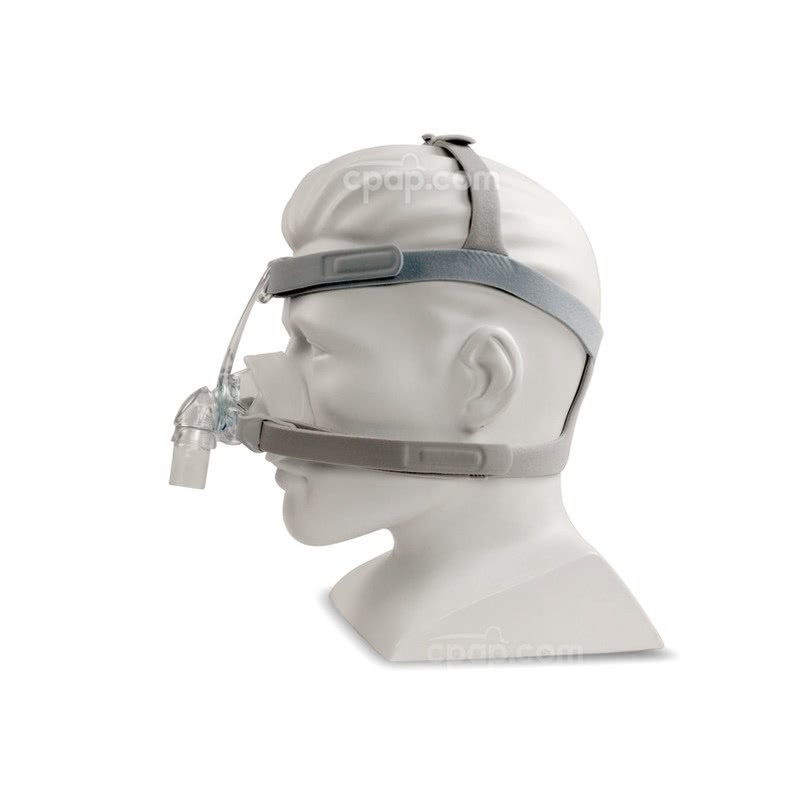 Fisher & Paykel's Eson 2 Nasal CPAP Mask with Headgear is a definitive minimalist mask. The updated RollFit nasal seal is adaptable, and it is designed to move with the user throughout the night to help maintain a strong seal. The included headgear is slim and offers multiple areas of adjustment for increased comfort. 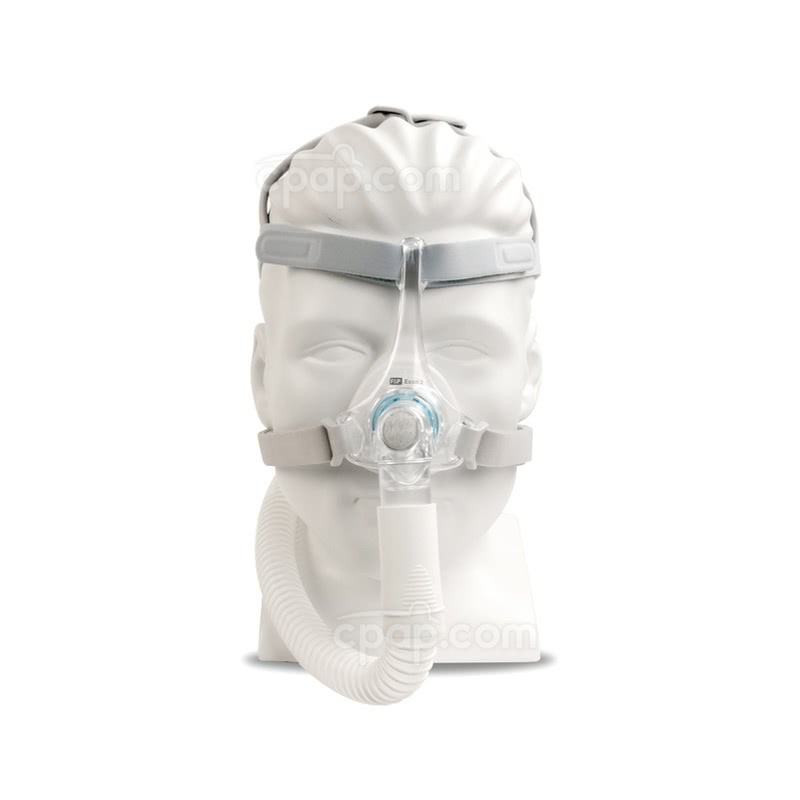 F&P's original Eson Nasal Mask is known for its RollFit seal. The adaptive design glides over the bridge of the nose to accommodate changes in sleep position throughout the night. With attention to helping maintain a strong seal regardless of motion, the mask is intended to prevent leaks and nasal sores. F&P's Eson 2 has a slimmer seal which accommodates various facial structures, helping to create the best fit. The cushion size does not impact comfort, as the design features a more supportive technology. The Eson 2 features a forehead stability bar which helps provide a more dynamic and secure cushion seal. The bar acts as an anchor for the mask, allowing enough cushion movement to help keep a seal during position changes, but with a secure enough hold to help prevent the cushion from moving too much which could result in leakage. The Eson 2 Nasal Mask covers less surface than the original design, which was already considered slim. The frame's ease of motion and a secure fit are further advantages of the RollFit technology. Also, the full motion elbow moves in 360 degrees, potentially decreasing issues such as mask drag. The frame is designed to fit all 3 cushions: Small, Medium, and Large. If the cushion in the selected size is not ideal, remove the cushion and try one of the other sizes. Please Note: This package does not contain all 3 cushion sizes. In order to try different sizes, the cushions must be purchased separately. Choose the ideal fit by adjusting one or more of the multiple adjustment points. 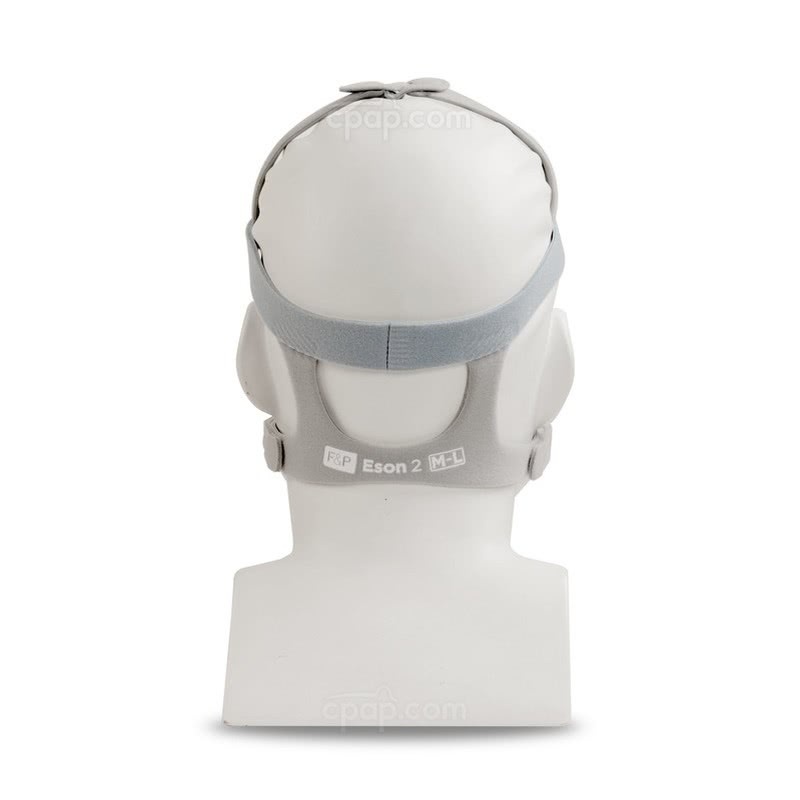 The forehead support and mask frame attach to four headgear points around the face, while the slim, grey strap found at the crown of the head adjusts to prevent the headgear from sliding in different directions. After the mask is comfortably positioned, the fit can be maintained even when removing the mask. Two headgear clips found on either side of the base of the frame unhook from the small rods for an easy release. A small, grey diffuser is found on the top of the mask elbow. The fibrous fabric is eco-friendly and serves to quiet the device as air releases from the mask. This part is replaceable and can be changed out to aid the longevity of the Eson 2 nasal mask. Whether cleaning the mask or dismantling parts for travel, the Eson 2 cushion, swivel, and diffuser are intended for assembly and disassembly. Insert the round, plastic opening on the cushion into the round opening in the middle of the mask frame and turn it to lock in place. The diffuser clips onto the top of the mask elbow, while the swivel attaches to the bottom of the elbow to connect the hose to the CPAP mask. The headgear and headgear clips are also easily removed and assembled. Place the grey headgear straps through the headgear clips and close the connection by applying the hook and loop fastener to the strap. Then, thread the pale blue straps through the back of the forehead support's slim opening. Then, wrap the strap over the opening so the hook and loop closure falls onto the strap for easy closure. How to Find Your Fit? With the goal of obtaining a comfortable and secure seal, the mask must be pulled over the head and then adjusted. With one hand hold the mask in place over the face and with the other hand, lift, pull, and place the hook and loop fastener on the blue straps until the perfect amount of tension is felt. Continue this step with the lower, grey straps found on either side of the mask frame. If further adjustments are needed, lift the two hook and loop closures found on the crown of the head and slide the material through the opening to increase or decrease tension. Note: The blue headgear straps need to lie above the ears when resting on the forehead. 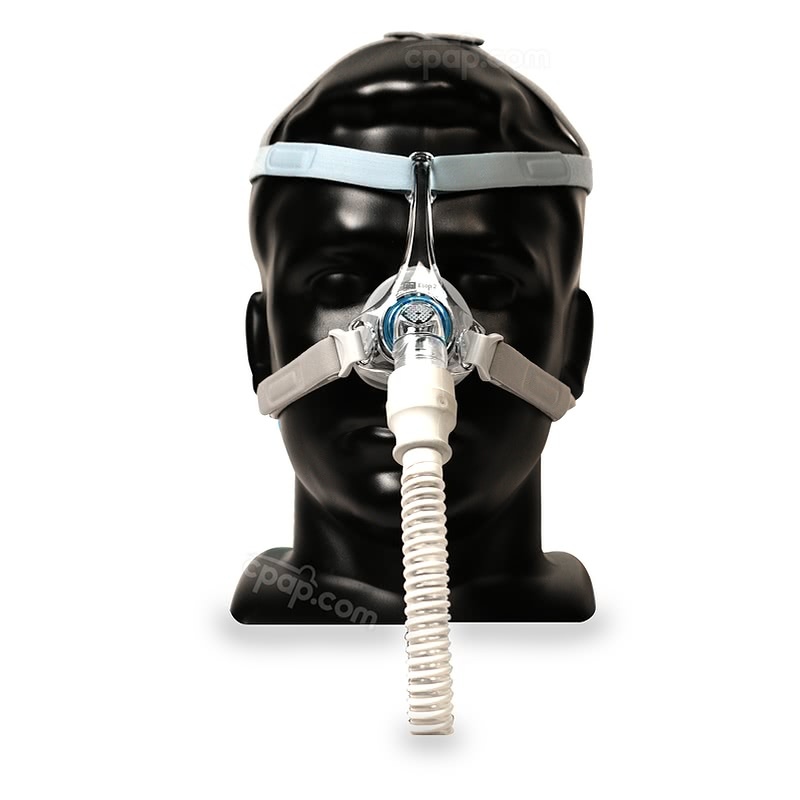 The Eson 2 mask frame is one size and accommodates all Eson 2 cushions. Therefore; a size is not located on the mask frame. HEADGEAR SIZING: Anyone ordering the small mask cushion will receive the small-sized headgear. Anyone ordering the medium or large mask cushion will receive medium / large headgear. An indention found at the top of the cushion extends downward and has a clear letter embossed on either side of the silicone. The letter "S" represents a Small, "M" represents a Medium, and "L" represents a Large cushion. 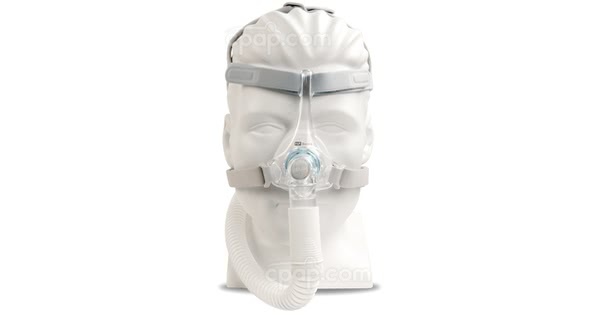 The manufacturer recommends the Eson 2 mask, headgear, and diffuser be washed in lukewarm water with mild soap for no more than 10 minutes each time. The mask needs to be washed each day, while the headgear and diffuser may be washed weekly. When rinsing all items, ensure the soap residue is gone. Allow the mask and parts to air dry away from direct sunlight.